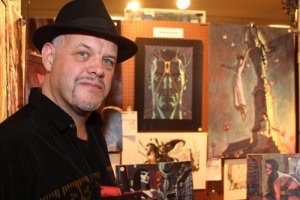 I never met anyone quite like John Watkiss, or as talented. Gifted and versatile in many forms of art, John was a portrait painter, illustrator, storyboard artist, character designer, sculptor, and mural artist. He’s worked in advertising, film, television, animation, comics, and taught anatomical drawing and fine art classes at the Royal College in London. Unlike most British comics artists, I don’t think John ever worked at 2000 AD. As was his iconoclastic style, his entrance into the British comics scene of the late 80s was unique and dramatic with Kiss of Death, a beautiful dark horror mini-series from Acme Press. All of a sudden everyone was talking about this amazing artist and his classic, yet modern noirish illustration style drenched in glorious shadow. Matt Wagner wanted John as one of the debut artists on Sandman Mystery Theatre. Neil Gaiman wanted John to draw Sandman. John’s haltingly regal interpretation of Sandman in the Marco Polo tale, “Soft Places” remains one of my favorite portrayals of the character to this day. Around this same time in the early 90s, John also drew some Legends of the Dark Knight, Conan, James Bond and Ring of Roses, an acclaimed mini-series first published by Dark Horse with writer Das Petrou. But, after his fleeting foray into the world of comics, John went on to dedicate most of his time to creating scores of concept and character design for film and television including—Tarzan, Sherlock Holmes, Sky Captain World of Tomorrow, The Walking Dead and the new Bladerunner film. But, I was still lucky to work with John periodically over the following years. Whenever he had a lull in his film schedule, he’d give me a call. All I’d have to say to my fellow editors at Vertigo, was that Watkiss was looking for work, and projects materialized: a run of striking covers on Human Target, series work on Deadman and Trigger. And seen by only a privileged few, was a flood of sweeping and spectacular concept art for a Sandman film trilogy presentation to Warner Bros. Clever, charming and dapper with more than a bit of the showman in him, John was larger than life. He loved astrology—he could guess your sign just by talking with you for a few minutes, and he never forgot it. I heard he was also great at magic tricks, and though I’d never seen John perform any, I could imagine that his sleight of hand was as fluid and confident as his brushstroke. John’s enthusiasm and passion for Surgeon X was unfailing, and we could never have done it without him. It is so sad and surreal to be writing this as we are closing out this storyline. John Watkiss was a true force of nature. An inspiration and teacher. A fighting spirit with a dreaming soul. An incredible artist who gave everything to his craft. A father, partner, son, brother, and friend to many. May you rest in peace, dear John. You will definitely be missed.